i would love to be included! thanks in advance! ? Watch out for those ripples….they are addictive. Ripples are the sole reason I learned to crochet. Have fun. I’ve been following your crochet progress on flickr, and so many of my friends have gotten the itch to start because of you, which is great! Hello! I’ve been following your blog for a while, but this is the first time I’m commenting. I’d love to join the swap, and have sent you an email. BUT – far as I know you can’t use WOOL in potholders, because of the heat?!?! At least that’s what I’ve always heared. You have to use cotton – it is much more heat resistant. Isn’t that right? Anyone who knows more about this?? I responded to your email a while ago, but wanted to post here, as well, to say that wool is very fire-resistant and burns at a might higher temperature than cotton. Wool also has great insulating properties. We have specified in the swap that synthetic yarns may not be used because we share the same concerns as you do. 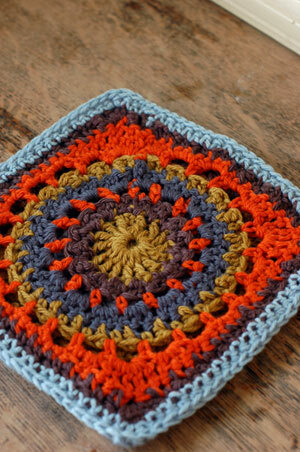 While I am certainly no expert, it seems that wool makes a great choice for trivets and potholders. Hello, I love your Gathered Scarf and would like to knit one myself. I have just started taking up knitting recently. May I know what is ‘Kfb’ in Row 13 means? Thanks. thank you for this easy, fun and beautiful crochet pattern. As a bag/purse lover, i made this into a purse. Loved it.